Casa Dragones, the cult sipping tequila, leads Cinco de Mayo into sophisticated territory. LAS VEGAS (TheStreet) -- How will you be celebrating Cinco de Mayo? If you want to spend it sipping the hottest tequila around, TravelsinTaste has found the one for you. Look no further than Casa Dragones, the cult sipping tequila that burst onto the marketplace in July 2009 with a mere 12,000 bottles and has taken off with tastemasters across the country. Bob Pittman, former COO of Time Warner ( TWX and founder of the Pilot Group and MTV, and Bertha Gonzalez Nieves, the first maestra tequilera, are the people behind Casa Dragones. Focusing on perfection, they produce only this one, rare style of 100% blue agave joven tequila, earning fans such as Martha Stewart, executive chef/co-owner of Le Bernardin Eric Ripert, top sommeliers and tequila aficionados for its smooth taste and finish. "I could have dark chocolate and Casa Dragones every night. It is delicious, very refined, light, with a tiny bit of citrus flavor," Ripert says. Casa Dragones has been poured at a number of high-profile events around the world, including last year's Vanity Fair Oscars party. Casa Dragones is gaining traction quickly. It has been paired by top chefs around the country and poured at a number of high-profile events around the world, including last year's Vanity Fair Oscar Party. No wonder: The tequila is hand finished, rested in oak barrels for more than five years and produced in small batches. "We're very connected to Mexican craftsmanship and to creating an authentic, elegant Mexican experience in every sip," Nieves says, calling Casa Dragones "the perfect choice to surprise your guests with this Cinco de Mayo." The tequila also has a distinct bottle design -- hand-crafted, lead-free crystal decorated with etched pepita seeds and sold in azure boxes -- that recently won the prestigious Grand Prix Strategies du Luxe award. Each label is hand-numbered and signed. Perfection can by pricey, though. 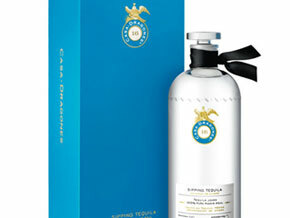 The tequila sells for $275 per 750 ml bottle. At that price one might not want to buy the whole bottle, but there's no need to consider an alternative tequila right away; you can simply visit one of the cutting-edge restaurants around the country (and of course Mexico) that sells the tequila, including Colicchio & Sons, Le Bernardin, Nobu 57 in Manhattan, Wolfgang Puck's Spago in Beverly Hills; Sinatra at Steve Wynn's Encore Resort ( WYNN - Get Report) and Mario Batali and Joe Bastianich's B&B Ristorante and Carnevino at the Venetian and Palazzo ( LVS - Get Report), respectively, in Las Vegas. If $275 is out of your budget and you really want to have a Mexican-inspired evening (with a little bit of celebrity chef drizzled throughout), stop by rm seafood in Vegas' Mandalay Bay Resort ( MGM - Get Report) where Top Chef Masters Season 2 cheftestant Rick Moonen will be collaborating with Chef Ralph Pagano, a Hell's Kitchen alum from The One Group's STK Miami, to create round two of the ultimate "Surf & Turf" dinners. Honoring Cinco de Mayo, the evening is centered around three hand-crafted specialty cocktails, rm seafood-style, with Platinum, Reposado and Anejo Ambhar premium tequila served alongside canapes. The $150-per-person, four-course meal, will feature Moonen's signature sustainable seafood dishes and Pagano's decadent prime cuts -- all with a Mexican flair and expertly paired with a wine selection. If you'd prefer something a little more decadent that allows you to let your hair down, the pool at the Mirage in Las Vegas is the place to be. Cocktail servers will be dressed in Corona hats and bikinis -- and giving away the hats, beads and necklaces with Corona purchases. Still hankering for tequila? No problem. An estimated 50 beachballs and a raft will be released in the pool at three times Friday and Saturday announcing the promotion of the Patron-based margarita and Patron shots (which are on the pool menu year-round, but gets special attention during this holiday).